We are a small scale sustainable farm selling to the public through CSA's and at our farm stand. We offer over 80 varieties of veggies, fruits, herbs, flowers and amazing salad greens. We also offer pastured chicken, ducks and turkeys. 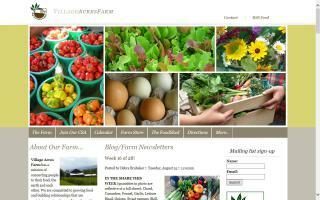 Check out our website for full details and pictures of the farm and produce. Friend us on Facebook to see our daily activities and get some great ideas from Chef Giles on how to use all the great produce grown here.